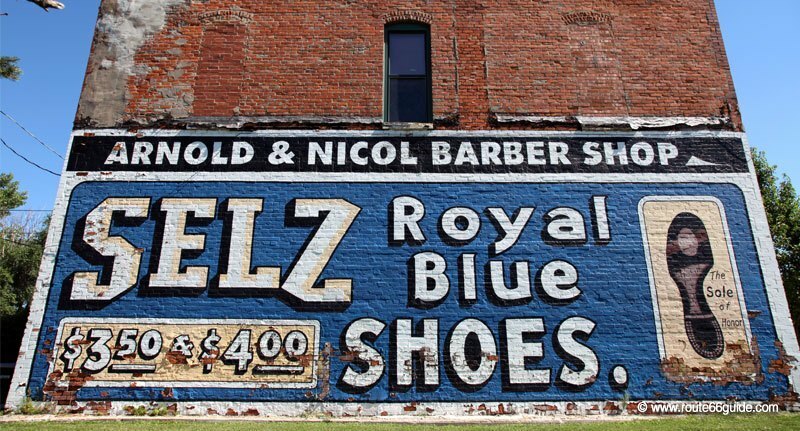 Above: Selz Royal Blue Shoes Mural in Chenoa, Illinois. Route 66 knew the beginning and the peak of the automobile culture. As a true icon of its time, it even contributed to the creation and development of novel advertising concepts addressed to new travelers in search of scenery and leisure at the end of the war. Indeed, the firs tourists rumbling down Route 66 were to revolutionize everything. Above: Joseph City, Arizona. Jackrabbit Trading Post. 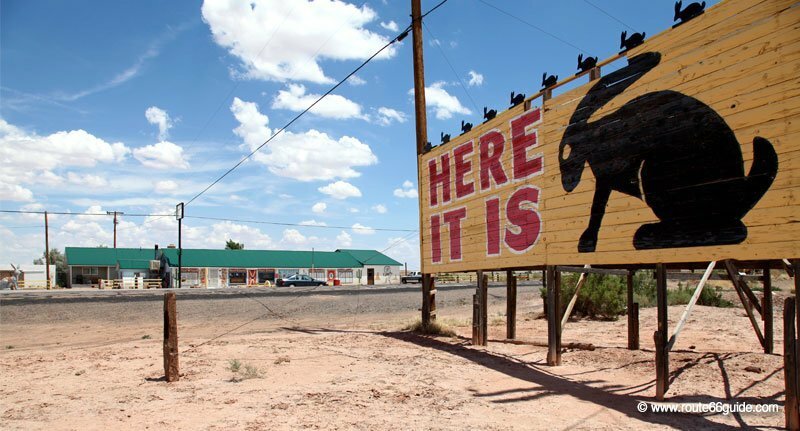 The giant yellow billboard displaying the giant rabbit of Giant Jackrabbit Trading Post is a photo-stop where Route 66 travelers regularly stop. Its gigantic letters read: "Here it is". A large number of identical panels once adorned the edges of the transcontinental route. Business growth and birth rates shoot up. Purchasing power, first paid holidays, family trips to Disneyland in California, now accessible by car! Travel is no longer a necessity but sheer pleasure. And the concept is totally innovative! Above: Pontiac, Illinois. The city is defined as the "Mural city" on Route 66. About twenty of them adorn the buildings downtown. 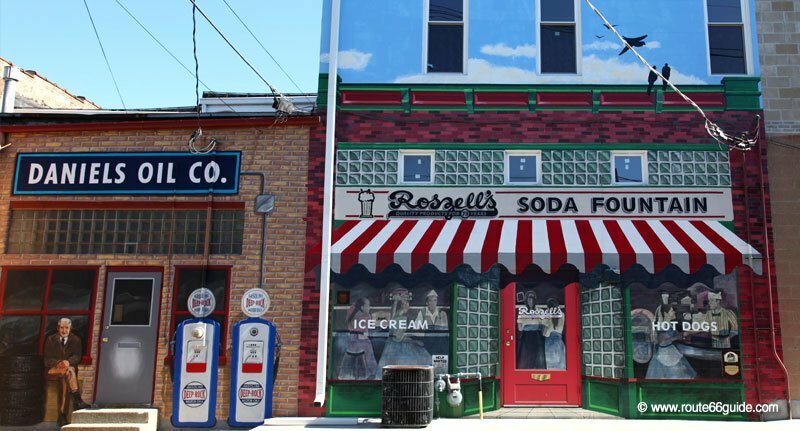 Our vote goes for the giant fresco trompe-l'oeil behind the "Route 66 Hall of Fame." 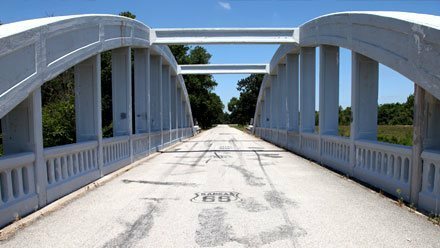 Above: Towanda, Illinois. Burma-Shave Signs. 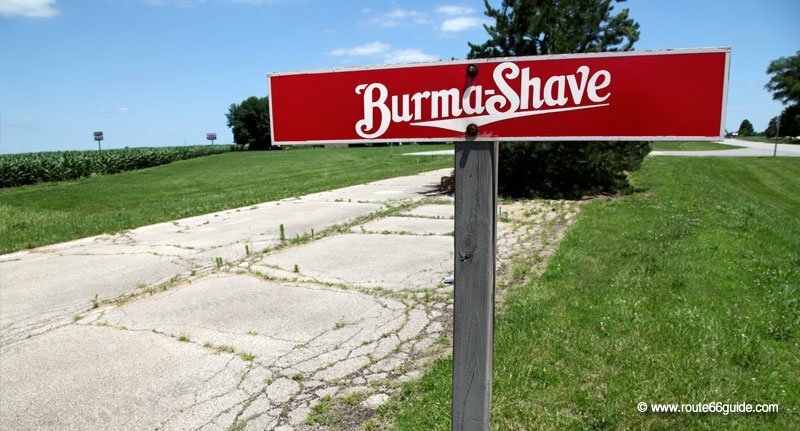 Symbol of a whole generation, "Burma" shaving cream signs lined the main roads of the United States. These small red panels were posted a few meters apart in close succession, featuring short and humorous slogans whose meaning was only revealed upon careful and progressive reading. 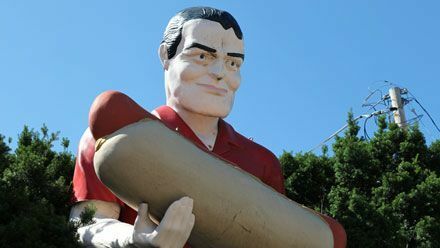 On the roadsides, all is designed to attract new customers and Route 66 is adorned with gigantic billboards, all-night-on neon lights, murals with innovative and sometimes provocative advertising slogans, oversized objects and characters, known as the "Muffler Men", who carried among other things axes, American flags, and disproportionate hotdogs to ensure the promotion of the related establishment. Above: Collinsville, Illinois. 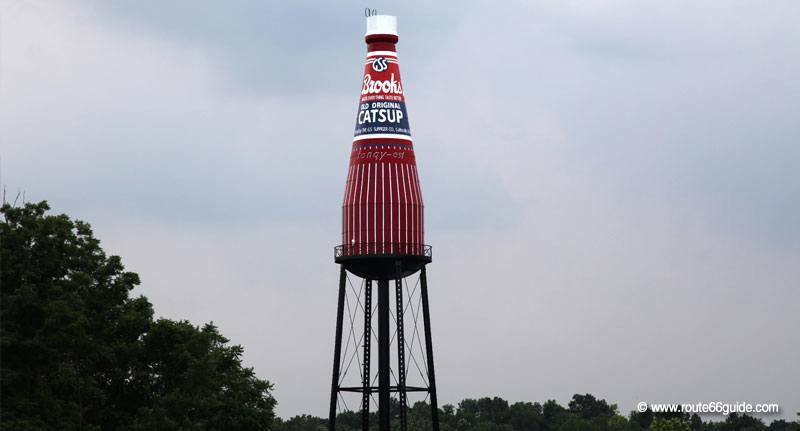 A giant bottle of ketchup stands in the city outskirts. 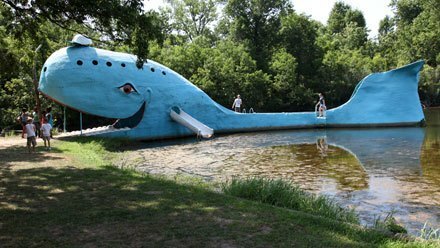 It is the world's largest. Above: Oklahoma City, Oklahoma. 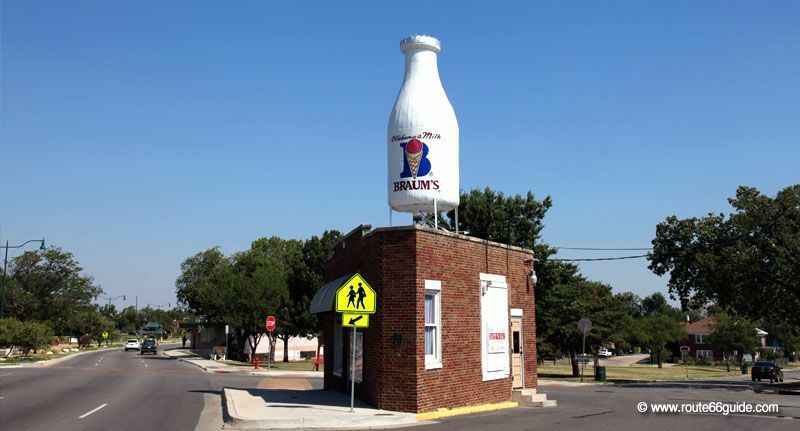 Giant bottle of milk. Interestingly enough, it now adorns a Vietnamese restaurant. There is no limit to the marketers' imagination; the larger, the more visible it is. Competition exacerbates ambitions and panels become monstrous. 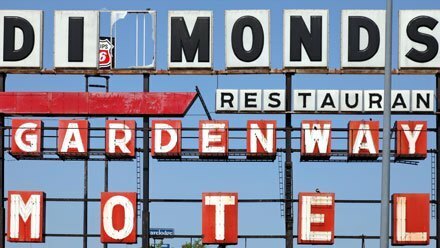 Some downtowns are but a succession of such panels, now mostly gone and ruined, e.g., the Central Avenue in Albuquerque New Mexico, at the time reputedly the longest street in the world with a record number of establishments in the 1950s, most of which are now closed. Above: Phillipsburg, Missouri. Meramec Caverns advertising Barns. Most Meramec Caverns advertising barns were demolished but two of them near Philipsburg escaped such grim final. 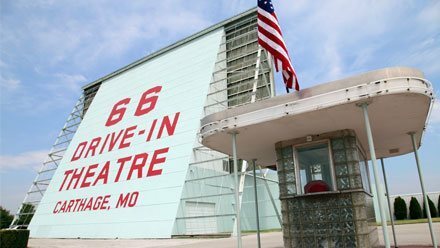 Fully restored, they promote today one of the most popular attractions of Route 66. Here, barns are distinguished by being two and painted blue (not red as customary in the past). 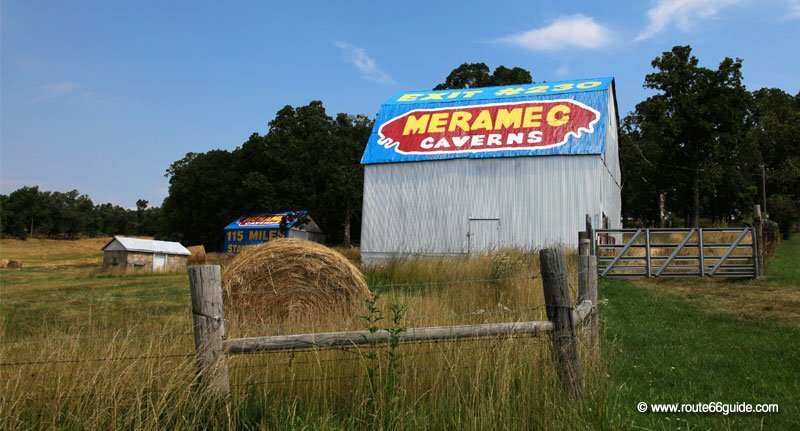 The owner of "Meramec Caverns" had even the idea of ​​buying dozens of barns along Route 66 and painting them in bright colors to draw tourists to its incredible caves - even though these were located dozens of miles away. 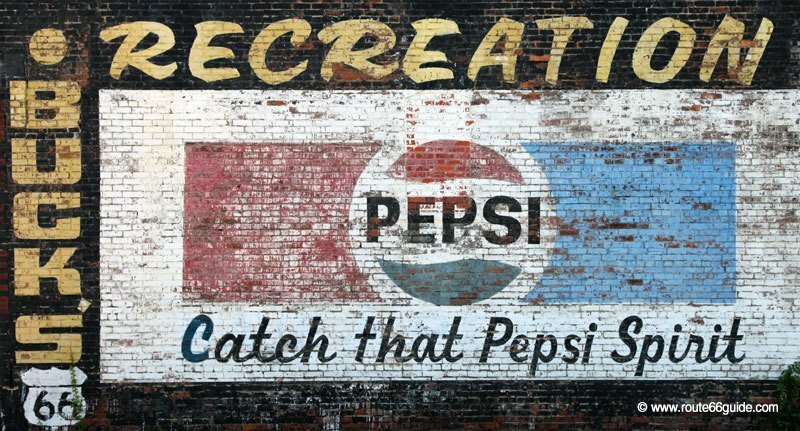 Above: Authentic "Pepsi" advertising mural washed out by the vagaries of time in the deserted city of Galena, Kansas. 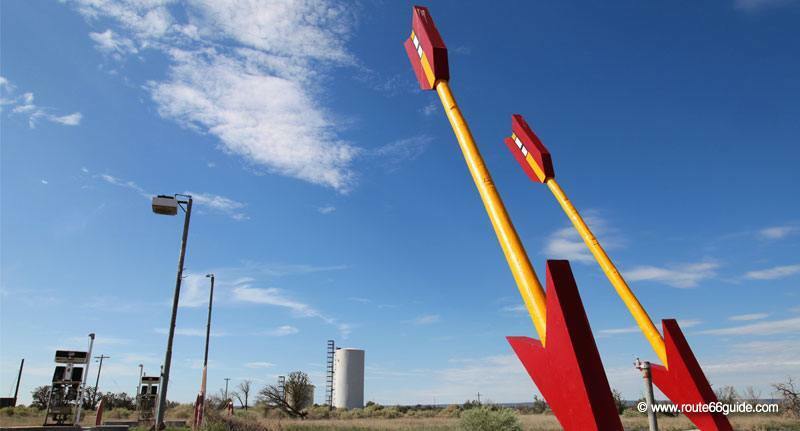 All these innovative concepts had one and a single goal: to catch the eye of Route 66’s traveler and - above all - stir the children's curiosity (read: "Route 66, a family icon"). In fact, children were the prime target of these new hyper-visual marketing, with bright and - if appropriate - joyful colors. 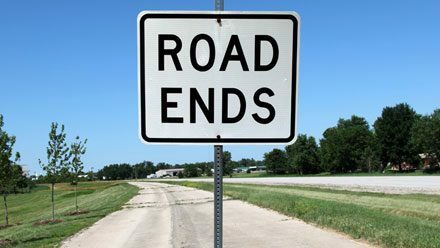 Throughout the 1950s, the new "baby boomers" generation swept up and down Route 66 and completely messes up its communication codes. 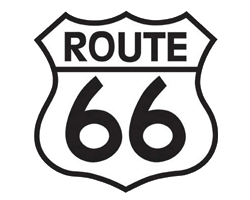 Route 66 becomes a bubbling family road. 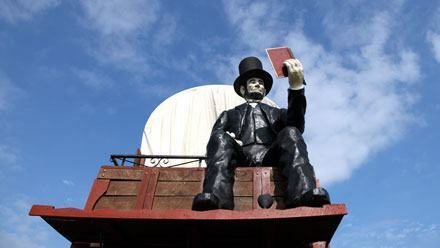 Travelling crowds want to be entertained - getting there is a given now.